Paris (AFP) – Since its birth in 1928 up to its planned marriage with Germany’s Siemens, below are the key dates in the history of Alstom, a French industrial jewel. The firm, which has a turbulent history, has been a symbol of French know-how in making trains such as France’s cherished high-speed trains, or TGVs. Alsthom, at the time spelled with a “h”, is born of the merger between Thomson-Houston, the French subsidiary of US group General Electric, and the Societe Alsacienne de Constructions Mecaniques. Having become in 1969 a subsidiary of the Compagnie Generale d’Electricite (CGE) — which will later become Alcatel — Alsthom merges with the Chantiers de l’Atlantique, the shipyards in Saint-Nazaire, which are today STX France. The group renames itself Alsthom-Atlantique. In 1982 the CGE and Alsthom are nationalised under the presidency of Socialist Francois Mitterrand. Alsthom merges with the GEC Power Systems arm of the British General Electric Company, which has no link with the American group General Electric. It becomes GEC-Alsthom, a joint Franco-British company. In June 1998 its shares are floated on the stock exchange. Fifty-two percent of its capital is made available to the public by the parent companies GEC and Alcatel. At this point the group loses its “h” and becomes Alstom. It becomes the biggest European stock exchange operation of the year. Despite refocusing on its two basic activities – transport and energy production – Alstom comes to the verge of bankruptcy in the early 2000s. Several rescue plans are put on the rails in 2003 and 2004 by the government of Jean-Pierre Raffarin but the European Commission imposes conditions on fair competition grounds. The state has to leave the capital of Alstom by July 2008. In 2006 Alstom sells control of the Saint Nazaire shipyards to Norway’s Aker Yards, which is then taken over by South Korea’s STX. The same year the French state sells its 21.03 percent share in Alstom’s capital to the French group Bouygues, which becomes the majority shareholder. In early 2014 Alstom is courted by US conglomerate General Electric and by Germany’s Siemens. The two groups submit rival bids in the spring, Siemens in partnership with Mitsubishi Heavy Industries. The French government intervenes, publishing a decree in May which extends to several sectors, including energy and transport, the mechanism which allows the French state to protect strategic companies from foreign appetites. The Socialist government of Manuel Valls finally comes down on the side of General Electric in November 2014. 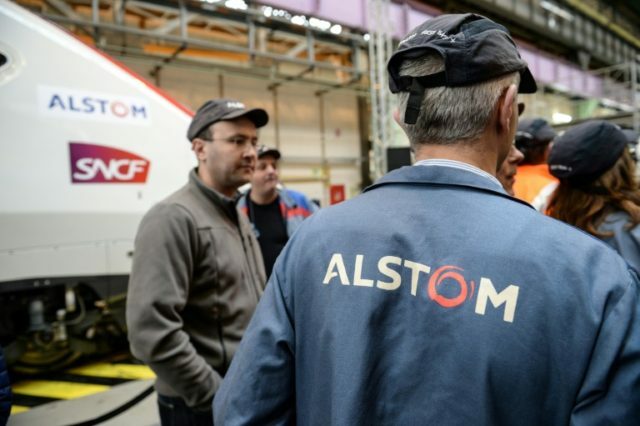 The American giant gets its hands on the energy arm of Alstom, which remains an independent group, refocused on railway equipment and with the French government holding a 20 percent share. Weakened by a drop in demand in France, Alstom announces on September 7, 2016, that it is stopping production of locomotives at its historic manufacturing site of high-speed trains at Belfort, eastern France, by 2018. The French state comes to the rescue, placing a huge order for high-speed trains to save the factory. On September 22, 2017, Alstom confirms it is in discussions with Germany’s Siemens, following reports that they are on the point of merging their rail businesses.